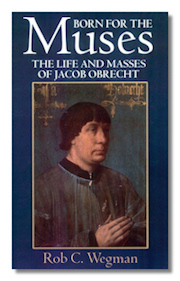 Born for the Muses: The Life and Masses of Jacob Obrecht (Oxford Monographs on Music), Rob C. Wegman. Oxford University Press. 1996. ISBN 0198166508 (paperback). Investigating the life of one of the most prominent composers in Europe in the late fifteenth century, Wegman enlarges our picture of the social and cultural conditions that framed Obrecht's world, drawing on a wealth of new archival sources and a newly discovered dated portrait that sheds light on his development as a composer. Jacques Offenbach and the Paris of His Time. Siegfried Kracauer (author), Gertrud Koch (foreward); Gwenda David & Eric Mosbacher (translators). Zone Books. 1937/2003. ISBN 1890951307 (hardcover). 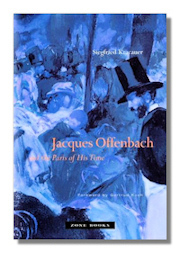 Siegfried Kracauer's biography of the composer Jacques Offenbach is a remarkable work of social and cultural history. First published in German in 1937 and in English translation in 1938, the book uses the life and work of Offenbach as a focal point for a broad and penetrating portrayal of Second Empire Paris. Offenbach's immensely popular operettas have long been seen as part of the larger historical amnesia and escapism that pervaded Paris in the aftermath of 1848. But Kracauer insists that Offenbach's productions must be understood as more than glittering distractions. The fantasy realms of such operettas as La Belle Hélène were as one with the unreality of Napoleon III's imperial masquerade, but they also made a mockery of the pomp and pretense surrounding the apparatuses of power. At the same time, Offenbach's dreamworlds were embedded with a layer of utopian content that can be seen as an indictment of the fraudulence and corruption of the times. This edition includes Kracauer's preface to the original German edition, translated into English for the first time, and a critical foreword by Gertrud Koch.